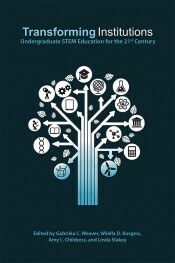 The book builds on the authors’ national reputations at the forefront of transformative undergraduate education research, and provides an overview of the context and challenges in STEM higher education. Contributed chapters describe programs and research in this area, reflect lessons from many perspectives, and describe suggested next steps in the path toward an aspirational new normal for STEM teaching and learning. You may order directly from the publisher and receive a 20% discount on print and electronic versions of this title by using code: PURDUE20. This title also is available from Amazon or Barnes and Noble.